British Sporting Cars (Australia) Pty Ltd was started in 1997 by Simon Young in a small shed in Kangaroo Flat, Victoria. Simon has had a passion for cars and a need for speed since he was a kid and he has been actively involved in the rally car scene in Australia and still campaigns a number of British marques in various rallies across the country. The business specialises in everything British and has grown from its humble beginnings to a new location that accommodates twenty four cars, an engine assembly room, a parts wash up area and adequate space for the manufacture of Works BMC parts and numerous fibreglass moulds and components. British Sporting Cars initially focussed on the mechanical side of things and through various requests grew into a turnkey shop that can provide anything a customer desires. Most jobs are tackled in house although they do not do painting or preparation but have a number of trusted partners that they manage for ground up restorations. Simon has been in the trade for twenty three years and gained a solid reputation as an engine builder, cylinder head and mechanical guru. Shelly joined the business nearly ten years ago and looks after all the front and back office duties and ensures the workshop runs smoothly and efficiently. Alec handles all the fabrication work, Jason is a fully qualified auto electrician and a couple of part timers round out the staff roster. The workshop has built a reputation for quality and detail and has worked on all BMC cars from 1950 onwards, MGs, Healey, Triumph, Jaguar, Riley, Aston Martin through to an Austin 7 Meteor. A lot of Morris and Austin cars have been through the shop including the 1100, 1800 and of course plenty of Coopers. They have worked on a few Ford Falcon rally cars by request from good customers and will tackle most projects if they are performance related. The list of services provided by British Sporting Cars is vast. On the mechanical side they perform everything from a basic service through to engine building, carburettor rebuilds, Lucas mechanical FI, cylinder head work, engine swaps and V8 upgrades. The business has performed a lot of rally and race preparation for clients and this normally includes performance tuning, upgraded brakes, exhaust and driveline components as well as the fitment of rally gauges, approved roll bars and safety specified equipment. One of the more unusual tasks they have been called on to perform was an Electronic Fuel Injection conversion on a Aston DBV8 (1970) that they completed and made it look period correct even though at this time it was not a factory option. The fabrication services offered are keenly sought after by enthusiasts who share Simons perspective that it is important to retain the character and personality of the cars without affecting their integrity. The Works BMC parts manufactured on site include skid plates, cast bar skids, brake lines, battery box, tow hooks, leather bonnet straps and accelerator pedals. Even though technology enhancements would allow better production processes the parts are still made in the original fashion to replicate the fit, finish and texture of decade old parts. Fibreglass fabrication covers all BMC and MGA panels, mini flares, boot lids, bonnets, fronts, Lotus Super Seven nose cones, TR7 V8 moulded arches and boot lids for Healeys. Spare parts are kept for restorations and British Sporting Cars do castings for knock off wheels, brake calipers and Works dashes. Full restorations are carried out and currently there are twenty four cars in the workshop in various stages of restoration. Due to the breadth of cars worked on and the expertise of the staff they often make parts, components and bits in a bespoke manner. The team at British Sporting Cars takes great pride in their workmanship and they believe their attention to detail, knowledge on all the British marques and the victories their customers have had in rallies is testament to their expertise and skill. The team put a lot into making cars enjoyable and reliable and have been rewarded by outstanding results including winning the Mini class in Targa Tasmania eleven times. Simon loves the Mini Cooper S and the BMC competition Department/Rally cars and has been involved in racing for many years. He was one of the founding members for the Historic Rally Association and wrote the original regulations for competitors and still campaigns a Group 6 Mini Cooper S and a Group 3 Austin Healey. The business supports local motorsport including sprints and hill climbs and has been involved in a number of club days and events over the years. 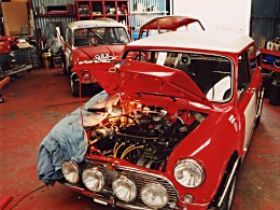 If you have a British classic car for restoration, need a mechanical tune or want to build a reliable competition car for race and rally purposes the team at British Sporting Cars (Australia) Pty Ltd would be glad to talk to you. The workshop is open 8.30 5.30 Monday to Friday and Saturday by appointment and you can phone at anytime to discuss your requirements. Simon and the team look forward to being of service to you.